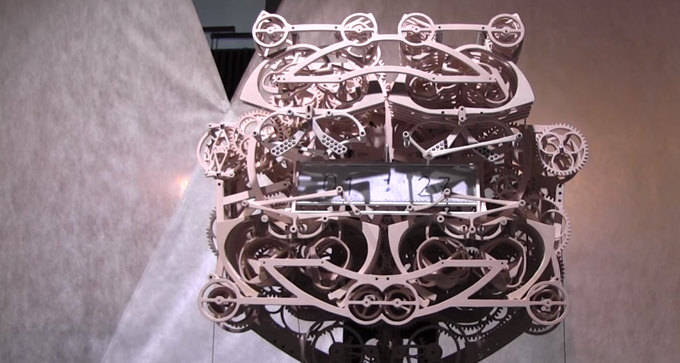 Students at the Tohoku University of Art And Design in Japan developed a rather complicated mechanical clock that uses a whole lot of parts just to tell the time. Specifically, the mechanical clock features around 400 wood components and four arms that literally write out the time every minute. The time itself is scribbled down and erased continuously, 60 times every hour, making for perhaps the most excessively complicated clock ever. I get it, though; it’s cool to build a mechanical clock like this but man, my smartphone makes telling time look so much easier. At the end of the day, some things are built to be complex just for the sake of complexity and for the right price, I would at least consider buying this contraption. What would be a better conversation starter than a big tacky mechanical clock that never stops moving sitting right at your front door?